All three scores are guitar-driven howls of instrumental force. But the Formula 1 soundtrack doesn’t go for the grime and grit of the lesser Destruction Derby Raw, or for Lifeforce Tenka‘s processed, haunting feel. Instead, Formula 1‘s pristine instrument sounds and the technical exactitude of its hundreds-of-notes-a-minute guitar soli match the immaculate high-tech precision of the racing cars that this music underscores. 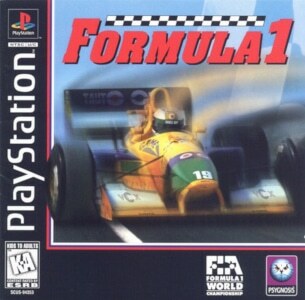 Psygnosis also licensed music from guitar virtuosos Steve Vai and Joe Satriani for the Formula 1 soundtrack. That of course meant that the pressure was on Psygnosis’ in-house musicians to match such instrumental prowess. Thankfully, when necessary, Stuart Ellis certainly lives up to the note-shredding standards set by these guitar gods. At the same time, Formula 1 never turns into a hollow display of instrumental pyrotechnics. “Track 1” kicks proceedings off with rock-solid, crunchy hard rock riffage and a comfortable groove. Its bluesy feel might be a rarity on the album, but smoothly eases listeners into the album. “Track 7” later revisits the same sort of groove-rock feel. It’s the kind of metal that’s confident enough to rely on a great riff and let it work its magic. Of course, there’s no shortage of guitar showmanship during these tracks’ soli. “Track 2” and “Track 11” are more pressing and urgent affairs. 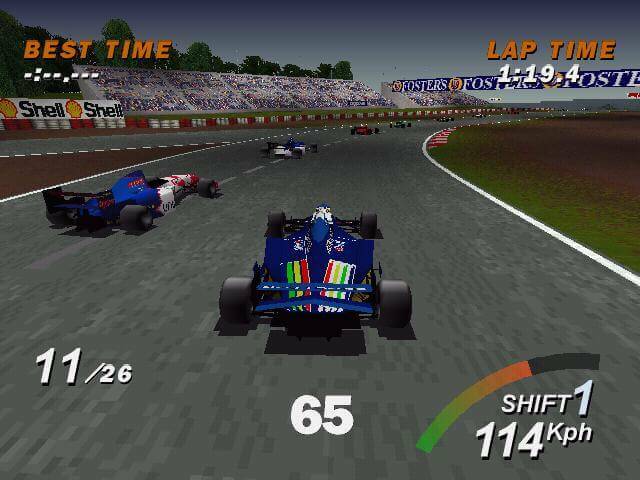 The music picks up speed and mental images of cars racing at breathtaking speeds are impossible to suppress. Ellis once more proves that his riffs are just as excellent as his soli, and like other cues, “Track 2” slows down to catch its breath at the beginning of its last third, before putting the pedal to the metal for a furious finale. When you put together fast cars and hard rock, it’s difficult not to think of “Highway Star”. And indeed, “Track 3” does sport shades of Deep Purple. A Hammond organ not only adds splashes of colour and character, but also underlines the influence that Ritchie Blackmore’s work has on Formula 1‘s sound. 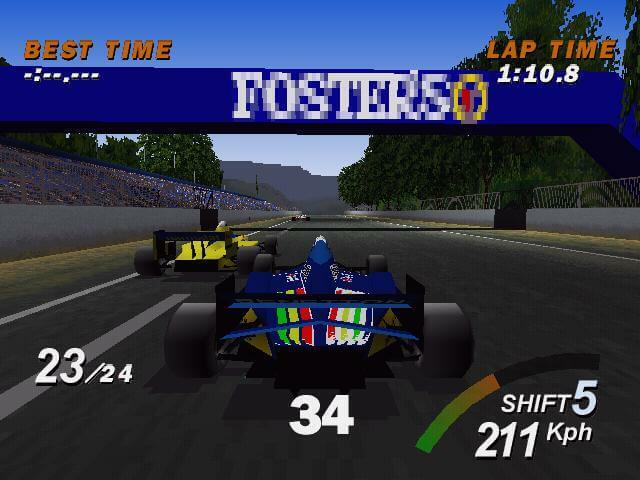 Judas Priest, Iron Maiden and Van Halen are other valid points of references that identify the Formula 1 soundtrack as a first-rate representative of classic heavy metal. Things only get better with “Track 4”, whose soli tear into the song with hair-raising intensity. Still more interesting is the cue’s central riff. It’s a rhythmically tricky, yet unexpectedly grooving show stopper that might be the album’s most creative single musical idea. It regularly trades places with monolithic jack hammer riffing, backed by the album’s first pronounced use of double bass drums. True, the drumming and bass lines of Formula 1 don’t attract as much attention as the guitar fireworks. Still, their rhythmic support is never less than flawless and at all times maintains the album’s exuberant energy. After the heaviness of the preceding cues, “Track 5” is a welcome breather. With its care-free attitude, “Track 5” barrels down the race track with a big grin on its face. Of course, there’s still space for lightning-fast guitar soli that lead to a huge, euphoric finale. That moment of exhilaration is followed by the Formula 1 soundtrack’s most creative concoction, “Track 6”. Clarke and Ellis prove their versatility and mix in funk elements that are as energetic as their rock counterparts, but lighter on their feet. The cue’s stroke of genius is the way it electronically chops up the guitar riffs during its B section. It then tosses shreds of the riff across the stereo field, in a way that cleverly matches the tracks’ opening stuttering funk rhythms, but in entirely unexpected ways. The score’s other noteworthy genre experiment takes place on “Track 10”. A particularly sludgy riff and growling bass lines make for the Formula 1 soundtrack’s grimiest track yet. Unexpectedly, Clarke and Ellis balance this focus on the bottom end with swelling and tinkling synth pads. Initially (as on “Track 9”), their job is to provide the guitar soli with an amorphous, cinemascope-sized backdrop, so they feel even larger than life than they already did before. But then, “Track 10” even drops guitars entirely during its mid-section. Instead, it throws in an unexpectedly atmospheric section dominated by those whale call-synths – before crashing back into the grinding opening riff with fierce abandon. You couldn’t ask for a more satisfying conclusion of one of game music’s best metal scores.